the rarest records in the world, from my personal collection! My name is John Tefteller. I have been buying and selling rare phonograph records for the past 30 years. I have a worldwide reputation for my knowledge of rare records, especially Blues 78's. My personal collection contains some of the rarest records on the planet. I have the world's largest inventory of Blues, Rhythm & Blues and Rock & Roll 78's with over 75,000 in stock. Most are store stock new. 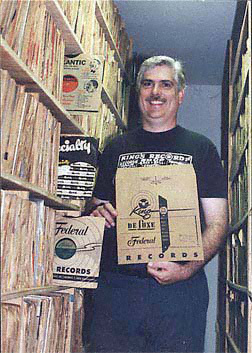 Besides my personal collection which I routinely share with the world via Yazoo CD's, I also have a fabulous selection of over 100,000 45's from the 1950's and early 1960's in the following categories: Blues, Rhythm & Blues, Rockabilly, Rock & Roll, Girl Groups, Surf and Country. Blues Images was first established as a Domain Name on the Internet in 1998. At the time, we had no idea that in just a few short years we would have a previously unseen photograph of Charley Patton and a treasure trove of original Paramount Records Label Artwork. When that collection was discovered and purchased, we knew it would only be a short time before Blues Images would become a reality. The vision of this company is to provide the world with the very finest reproductions of classic Blues Images. As this business and website develops you will have access to a whole new world of important photographs, posters, advertising images and rare records--all available to you with the click of a mouse. Much of what we do here will be for show. This website will become THE place to go to see classic images, record labels of unbelievably rare records and news of the latest discoveries in Blues collecting. Some items will be for sale and we hope that, if you like what you see, you will help us by purchasing our products. The more we sell and the more popular this website becomes, the more in depth and expanded Blues Images will become.You will discover very quickly that everything we sell is of the highest possible quality and our service is impeccable." Anything I sell comes with a 100% money back guarantee. If you are not satisfied for ANY reason, just return the item in the same condition as sent to you for a full refund, including your return postage costs.